Last month I was honored to be interviewed by ARLISnap, a great organization for young professionals looking to get into Art Librarianship. As someone that is new to this position, it was a great way for me to reflect on my past experiences, and a stark realization that I have reached this goal of becoming an Art Librarian — something I have been chasing for 10 years. After this interview I had another small epiphany : in many ways, its artists like O’Keeffe that are responsible for where I am today, in more that one way. Ms O’Keeffe is a shining example of a woman who knew her passions and let nothing stop her from practicing them. She embraced chance and serendipity, while also making her own luck. These are ideals that I have come to live by. So thanks Ms. O’Keeffe, for paving the way for young women like myself who try and live up to our own standards, instead of anyone elses. 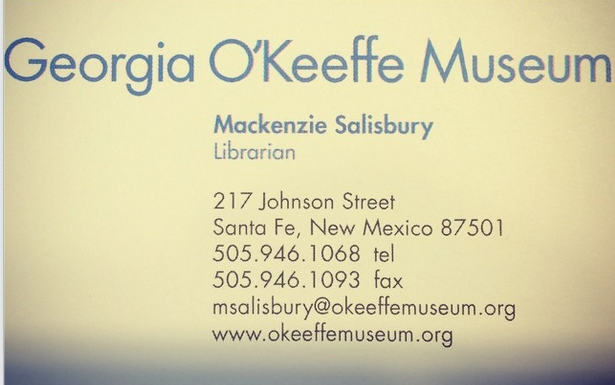 An active ARLIS/NA and ArLiSNAP member, Mackenzie Salisbury, recently accepted her first art librarian position at the Georgia O’Keeffe Museum! We asked her to share her journey from having staff and non-traditional art librarian positions to her new job, as well as any helpful advice. 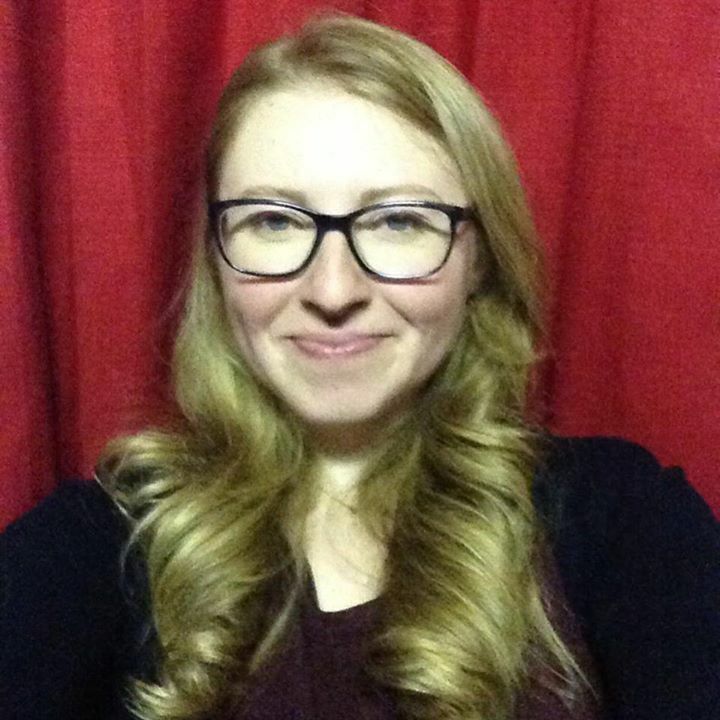 You can connect with Mackenzie on her LinkedIn profile. Art librarianship snuck up on me. My first job as an undergraduate was in the slide library in the Art History department at the University of Maine. It was perhaps my favorite job in college, but never really thought of it as a “library” job until much later in life. I graduated with an Art History degree from the University of Maine and then took a few years off to figure out what I wanted to do next. I moved to Chicago, IL with a friend, and our apartment happened to be across the street from the Newberry Library. After wandering in one day and looking at some of their incredible map collection, I starting interning one day a week. After that, I was hooked! I started my MLIS not long after through Drexel University. Currently, I am the Librarian at the Georgia O’Keeffe Museum. Although a simple title, my role here deals with a number of traditional and out-of-the-box views of what a “librarian” does. Not only do I deal with reference and collections, but I am also responsible for thinking innovatively when it comes to newer technologies that might enhance the museums collections. What did you do before you accepted your current position? I’ve always been involved in special libraries. I interned at the Art Institute of Chicago, worked as the Access/Circulation Supervisor at Northwestern’s Law Library, and cataloged at Harrington College of Design. Professionally, I was an Information Services Librarian at Northeastern Illinois University (NEIU) on the north side of Chicago. It was my first professional job out of library school, and I learned an incredible amount from the most amazing colleagues. How did you get your current job? Do you have any job-hunting advice? My current job came to me through a series of incredible networking moments, a great mentor, and my willingness to say YES! I found out about the position at ARLIS/NA conference in DC and my mentor, Leigh Gates, encouraged me to sit and chat with the HR representative that was doing the interviews. From there it was a series of impromptu meetings ( the first time I met Eumie, my current boss, was at the reception of ARLIS/NA at the Library of Congress – very magical. We sat on a bench and talked informally for about an hour! ), a Skype interview with the team here, and then a quick trip to meet everyone and see Santa Fe in person. I am proof that social networking works. I obtained my first job at NEIU because of being connected on Facebook. A friend of a friend posted about the job, and the next thing I knew I was interviewing. 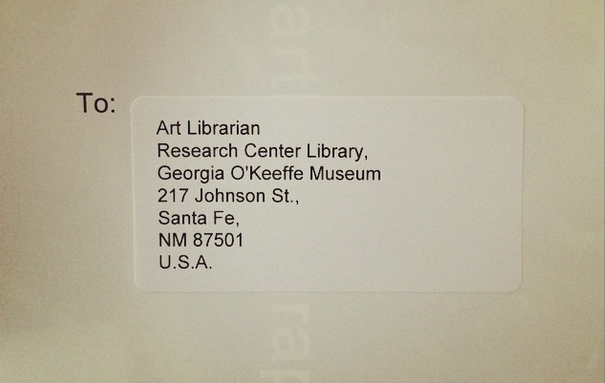 Getting this position as Librarian at the Georgia O’Keeffe Museum was due to the close relationship I had with my mentor, and her connections in the art librarianship world. Before getting the job offer at the Georgia O’Keeffe Museum, I had never been to the Southwest before, nor was it on my top ten dream places to live. That being said, Chicago has a number of great library schools in the tri-state area, as well as some great academic and cultural institutions, which makes things VERY competitive. By widening your search area, you have a better chance of finding a great job! When I first got out of library school, my expectations were that I would find a job in art librarianship right away. I mean, I had the background and the skills, what else would I need? The answer is experience. Even though my first job wasn’t art librarianship, I learned more about libraries at NEIU in the two years I worked there than in any previous position. So even if it’s not the ideal job, say YES! Getting your foot in the door is the first step. What are your main roles/duties at your current position?/ What is a typical day like for you? As the Librarian at a fairly small institution, I have many roles within the museum. Firstly, I maintain the Research Center in conjunction with the Research Center Assistant. That can be anything from assisting researchers, cataloging, collection development, and even policy writing. Because of the scope of what I manage, there is no “typical day”, which is something I really love about my job! What was the hardest part about transitioning from staff/part-time, etc. to an art librarian position? For me, the hardest part about going from a generic “Information Services Librarian” to an “Art Librarian” was the amount of new knowledge I needed to become an expert in ASAP. Georgia O’Keeffe is an artist we all learn about in school, but the depth of information we have on her here is so expansive that I’m still learning new things about her. Additionally, adjusting to the authority that I now have as the Librarian, instead of the amazing group of librarians I worked with before. Talk about pressure. I think that librarianship in general, as well as art librarianship, really suffers from preconceived notions about what a librarian really does. For me, I find that a better description would be “information literacy advocates,” or “art information czars” (ok, that might be a little strong but you get the idea). So many people think about libraries in a very specific framework, and they rarely notice that we have in fact adapted to the 21st century. Our work is not entirely based on books! I see this throughout the museum and cultural institution community here in Santa Fe, which is substantial. Breaking through those stereotypes is probably the hardest part of my position. As many of you know, the competition is fierce. So many amazing professionals are emerging on the scene from some amazing new programs. Don’t be discouraged! I think that new art librarians like myself need to have a wide array of skills, including technological. Try to think outside of the box when it comes to libraries in general. The more conversations I have across departments here at the museum, the more I realize just how valuable many of the skills I have (and necessary new ones) are in the technology arena. As libraries adapt to a new age of how people want to access information, librarians must adapt as well. Since I just moved from Chicago to Albuquerque, most of my spare time is spent figuring out this new city! I also really love exploring the Southwest – from camping to trying New Mexican food to brewery touring! Oh, and I’m on a mission to find the best Mole in the great state of New Mexico. September 5, 2014 in Research Center.